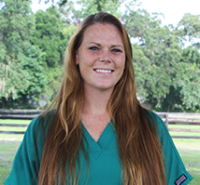 Originally from Pennsylvania, Amy moved to Ocala in May 2012 with her fiancé, four horses and three dogs to join the EMCO team. Her background includes ten years of experience at the University of Pennsylvania, New Bolton Center primarily in emergency critical care. She grew up with horses, trained and competed in hunter/jumpers, and exercised race horses in early mornings. In her free time, she enjoys riding, training her three year old thoroughbred for the hunter/jumper arena, painting/sketching, fishing and just being outdoors. Amy and her fiancé love the Ocala area and look forward to building their life together here.